The “bitter invention of Satan” is how churches in the middle ages deemed coffee, when it was first discovered. But in about 1600, Pope Clement VIII is popularly supposed to have blessed it, by declaring it delicious and today espresso is regulated by the Italian government. FYI, espresso is created by pushing hot water, at high pressure through ultra fine grounds. To begin with early espresso machines had a lever to pull when instigating the coffee brew. (Hence the term “pulling” a shot) but nowadays most modern machines do this by a simple button press. Standard amounts of coffee grounds are 7-10 grams for a single shot and 12-18 grams for a double. These are then compressed to make a coffee puck. The hot water is blasted through the porta-filter into the espresso cup or shot glass. The beverage should then be served at around 165 degrees Fahrenheit and drunk whilst still at this temperature, as the quality rapidly deteriorates with the heat loss. At least that’s how I like it – HOT! Sitting somewhere in between the Breville BES870XL and the De’Longhi EC155 lies this machine, the Breville 800ESXL 15-Bar Triple-Priming Die-Cast Espresso Machine, to give it its full title. 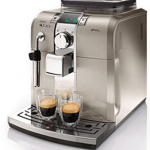 This espresso machine review will judge this machine principally on style, practicality, quality, price and value for money. 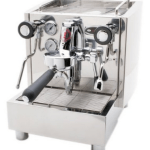 Not super expensive, but hardly a snip either, you can find this espresso machine competitively priced on online shopping portals, as it is readily available these days. Made in stainless steel, this cute little apparatus is a bit like having a mini coffee shop in your kitchen. But if you’re a tiny bit awed by the holiness of the espresso making ritual, you can still use pods such as an ESE pod filter, which is included. Of course you can make much more than just espresso. The steaming/ frothing wand allows you to make lattes and cappuccinos and this machine can also do up to three more espresso variants and that’s not including all that your imagination can conjure up. This is a 15 bar Italian pump thermoblock heating system with a canny auto purge system for resetting the temperature accurately for the next beverage to be dispensed. It is semi automatic. Like it’s slightly snootier sister the BES870XL it comes with a handy “clean me” reminder function. If you’re looking for an espresso maker which has that truly professional look to it, the Breville 800ESXL has a die-cast steel exterior that gives it that extra bit of pizzazz that make people sit up and take notice. Based purely on looks, this die cast appearance looks great both in your café or in your kitchen – take your pick! You Want It? You Got It! Like many other machines also featured in this espresso maker review it has a hot water dispenser to make tea, hot chocolate, and other types of coffees (eg. an Americano) easily and efficiently. Freebies? 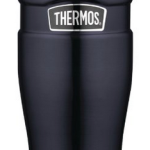 Included with it are filters for either your own ground coffee and one for a pod. There is also a tamping spoon, steel frothing jug and cleaning tools. You can make between 2-5 cups per brew with this machine and it helpfully comes with more than a foot of cord length, making plugging it in less of a problem. 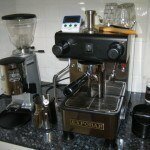 If you like having the control over the length of time it takes to pull your espresso shots (ie not all self automated) then this machine may be for you as you can do exactly that, which gives it a bit more of an ‘old school’ feel than perhaps some of the other products mentioned in this espresso machine review. By all accounts, if you’ve already read a few different espresso maker reviews, this machine still ranks highly by comparison. 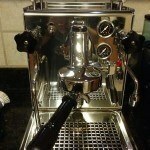 It is a great machine that makes truly wonderful espresso, with a nice amount of crema. The only question marks point to the longevity of this product after the one year warranty has expired. It is a beautiful little espresso maker, which does not hog all your counter space and makes perfect coffee for the price. So, should you buy this espresso machine? 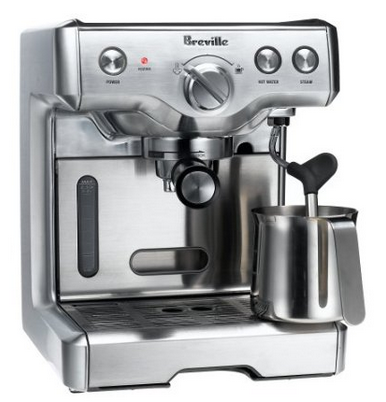 The manufacturer, Breville, have a good reputation generally and also specifically for coffee makers. Other espresso maker reviews have praised them and the overall consensus is that they are a reputable brand to buy. This machine does not make any duff cups of coffee and looks great in anyone’s book. It is just as suitable for the complete coffee novice as a wannabe barista waxing creative coffee art urges. The only note of caution this espresso maker review would sound, is that there has been some question of the device’s longevity. However, a lot of this may be down to upkeep and cleaning of the machine and as long is this is undertaken regularly, it should be fine. IS THERE A SPECIAL BEAN TO MAKE ESPRESSO WITH? No, there is not one specific type of coffee bean that is used to brew espresso with. DOES ESPRESSO HAVE A SPECIFIC LEVEL OF ROASTING IT NEEDS? No, again this is all down to personal taste. Some areas and people like them more heavily roasted and others do not. HOW IS AN ESPRESSO MADE? Espresso is generally a tablespoon of finely ground coffee beans brewed quickly or “expressly” for about half a minute, no longer. If done correctly, this will incur a dark golden creamy layer known as the ‘crema’. This is made from the oil in the coffee bean and unique to espresso. IS ESPRESSO VERY HIGH IN CAFFEINE? Not as much as people think it is. 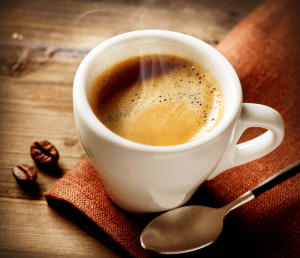 An “ordinary” coffee has about 115 milligrams of caffeine in it versus the espresso’s 80 milligrams. However, this is mainly because espresso shots are much smaller. 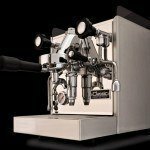 What Is A PID Controlled Espresso Machine? Copyright © 2019 Know Your Grinder.